So you’re probably thinking, enough MINI posts already. Yeah, sorry about that, but I can’t not write about this one. Turns out that within the past couple of weeks MINIInternational (one word) launched a community-based website for MINI fans with creative sensibilities. It's the site I've been waiting for! The concept behind MINIspace.com is based on a phrase coined by the designer of the original Mini, Sir Alec Issigonis. Upon drafting the first sketches of the original Mini, he touted it as a "Creative use of space." When I stumbled upon this site, you better believe I was stoked. I set up a profile and notified my MINI driving friends. However, I’ve dug through this site and unfortunately its not as cool as I hoped it would be. I like features such as the blog, the size of the profile pics, and the random design contests they host. But the personalization of the profile pages is weak, the custom backgrounds are limited and there’s absolutely no thought put toward featuring both a car and a driver. Last week, my family from NY was in town, so on Saturday, Normailty, Snizzle and I detailed the cars and headed over to a local middle school for a morning photo shoot. 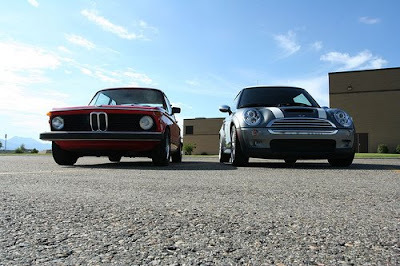 I borrowed the ultra-wide Canon lens from Struck and got down and dirty with some vehicular glamour shots of my dark silver 2006 MINI Coopers S and my cherry red 1975 BMW 2002. Thanks to my killer b-day present from Mrs. Kyality, my sliver 2008 Specialized Sirrus also joined the vehicle roster. 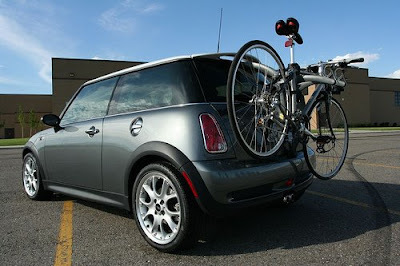 She got me a brand new set of Saris Bones 2, the ultimate MINI Cooper bike rack, recently discovered by Southern J. The thing seriously looks like it was made for a MINI. As you can see, it was a beautiful morning and we had a blast composing each shot. It was also a bittersweet event. 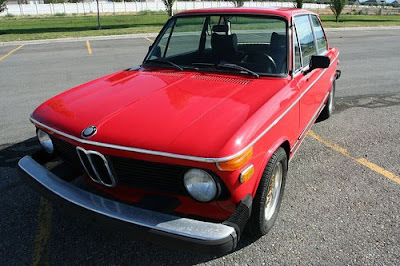 I’ve decided after 5 years of back and forth to sell my Bimmer. So the secondary purpose behind the shoot was to capture some "for sale" images. Don’t get me wrong, it’s a fun car, I love the way I feel behind the wheel. It’s classic, I feel like I know something that no ones else on the road knows. However if you don’t have 1) a ton of extra cashflow 2) a mechanical mind or 3) a fix-it dood who owes you a favor or ten—owning a vintage auto just isn't worth it. 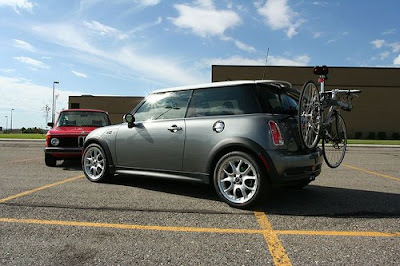 Plus, and this is the good news, the MINI totally fulfills the “I know something you don’t know” vibe. So enjoy the pics. You can see more at my brand new Flickr Stream and if you’re in the market for a cherry red 2002, you know who to contact! They're a fun pair of rods. At this ultra-wide angle, this little Cooper looks almost Clubman-like! So What’s YOUR Carfun Footprint? It’s been a long time dream to do advertising and design for MINI. And as of yesterday the realization of that dream launched. 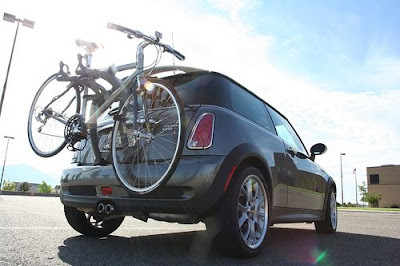 Meet the MINI Carfun Footprint Calculator. What is a Carfun Footprint you might ask? Well, it’s a unit of measurement that pits your car’s fun factor against its environmental impact. This is an actual quantitative number calculated by a combination of legitimate sources. And once the facts were in, guess which car came out on top? 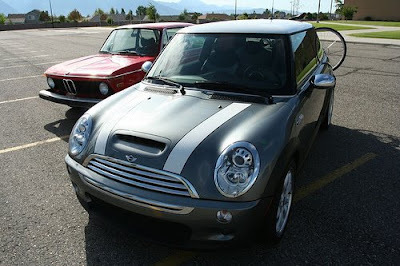 Yep, the MINI Cooper Hardtop has the ultimate combo of fun vs. green on the road today! BSSP developed a killer concept and Struck was responsible for the final design, 3D, motion graphics and development of the Flash app itself. Every time I play with the thing, I’m absolutely blown away by the killer 3D, texturing and motion that the team cranked out. We actually did use quite a few photos from the Clubman shoot from a few weeks ago both as reference and as actual textures as well. The entire site experience will also literally be delivered through some serious rich media banner buys, which is an awesome feat in and of itself. 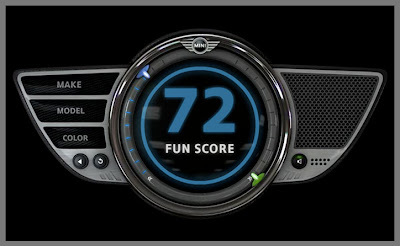 So if you see a Carfun banner in your daily perusal of the world wide web, make sure to play with it for a bit then click through to miniusa.com and configure a Cooper of your own. But just remember, I call Hot Chocolate!